[Posted on 21st June] The final version of the PG Conference programme and the abstracts are available on the website. Therefore, please refer to the latest files before deciding which sessions to attend. Thank you very much. 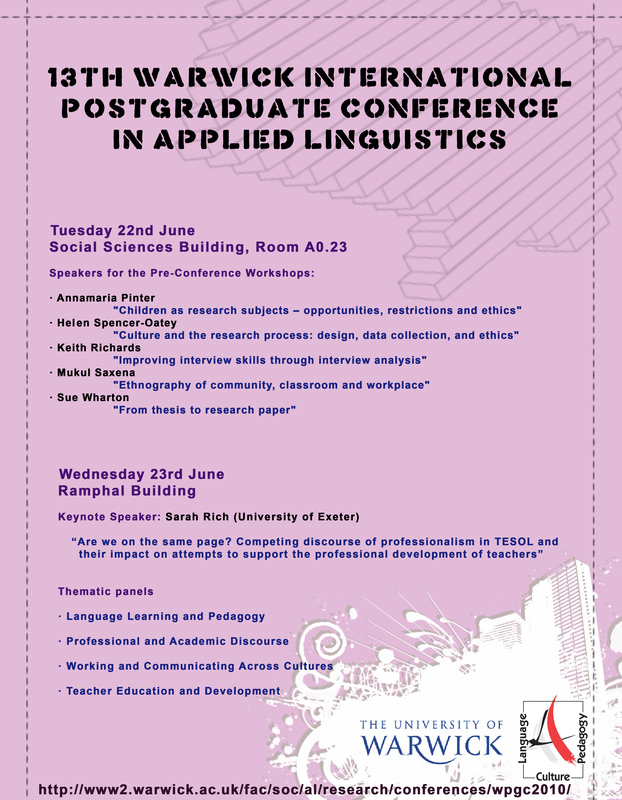 The Postgraduate Conference aims to offer the opportunity for postgraduate students from various areas in language teaching and applied linguistics from any institution to present their research, to attend experts' keynote presentations, to meet peers who engage in similar research activities, to practise their presentation skills, and to get valuable feedback on their research. This year will see our first-ever pre-conference workshop on the previous day by five distinguished researchers from our Centre which will cover various aspects of research methodology and research themes. We welcome anyone to attend the workshops. Please note that the university is in Coventry, not in Warwick. Click here for more information on the location, click here for a map of the campus, and click here for accommodation. Keith Richards (University of Warwick) "Improving interview skills through interview analysis"
Sue Wharton (University of Warwick) "From thesis to research paper"
Helen Spencer-Oatey (University of Warwick) "Culture and the research process: design, data collection, and ethics"
Francesca Bargiela (University of Warwick, Honorary Associate Professor) "Researching (with) Professionals; what practitioners can teach us about our research"
Mukul Saxena (University of Warwick) "Ethnography of community, classroom and workplace"
Sarah Rich (University of Exeter) "Are we on the same page? Competing discourses of professionalism in TESOL and their impact on attempts to support the professional development of teachers." Please click here for more information on the speakers' abstracts and programmes. We welcome presentations from any area in language teaching and applied linguistics. We will categorise the abstracts into four main research areas in line with the Centre for Applied Linguistics' research groups . Please click here for the call for papers. Conference OrganisersThe PG Conference and the PCWs are organised by postgraduate students under the auspices of staff members in the Centre for Applied Linguistics, University of Warwick. Click here to find out more about the committee members this year. Monday 10th May 2010: Deadline for submission of abstracts . Monday 17th May 2010: Presenters should have been notified by this date. Monday 24th May 2010: Online registration opens. Monday 31st May 2010: Early bird registration closes. Monday 14th June 2010: Standard registration closes. Free for all Centre for Applied Linguistics staff members and students.